Space Mountain is an indoor roller coaster that is located in Disney theme parks around the world. This article covers the Space Mountain roller coaster that is in Tomorrowland in the Magic Kingdom, Walt Disney World Florida. 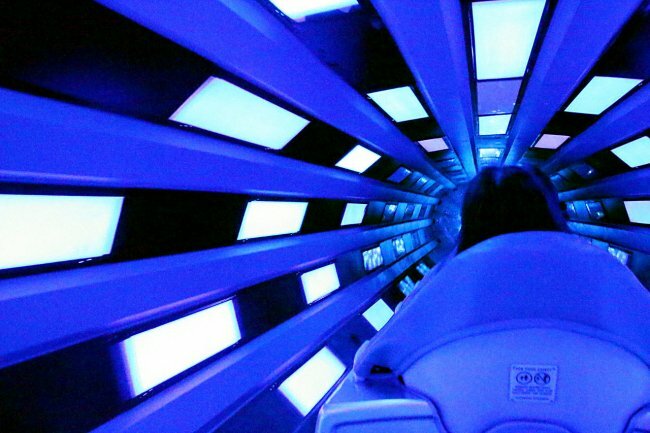 In this article we specifically go over all of the Space Mountain tunnels. Space Mountain has two tunnels that are part of the ride. The first tunnel is located at the start of the ride, right after the initial turn and stop. This tunnel is the blue colored tunnel that takes you to the launch area. The launch area is the slope or climb to the top of the ride. The second Space Mountain tunnel is located near the end of the ride. It is located right before the end at the bottom of the attraction. The second tunnel is colored with red lights. After going through the red tunnel, you are transported the unloading area or station, where you head to another “tunnel” to exit the ride. Space Mountain has a tunnel that is part of the line to get on the ride. The line goes underground into what can be called a tunnel. 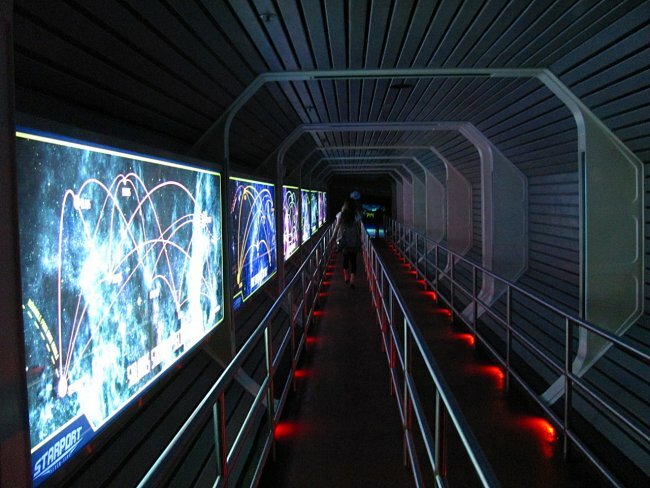 The loading area of Space Mountain is “underground”, however, it is likely part of the “utilidoor” level for the park. The Magic Kingdom was built on top of a structure that allows Walt Disney World cast members to access the different areas of the park from beneath. A portion of this tunnel is commonly called the Star Tunnel. You can also learn more about the line on our line or queue page. Above photo of the Star Tunnel (entrance) for Space Mountain by Loren Javier on Flickr. Photo released under a Creative Commons License. There is also a “tunnel” at the end of the ride, after getting off the ride, that takes you to the gift shop area. This tunnel has a moving walkway that brings you back up to ground level. The tunnel walkway is angled upward and has numerous displays of space themed items, including some items that are based off of the former Epcot Center Horizons ride. Also apart of the exit walkway are some video cameras that display your image on some of the video screens that are in the exit tunnel. The tunnel takes you to the Tomorrowland Light & Power Company gift shop area that serves as the gift shop for Space Mountain. At the gift shop you can see an image of you and your party on the ride and purchase photos of the image. 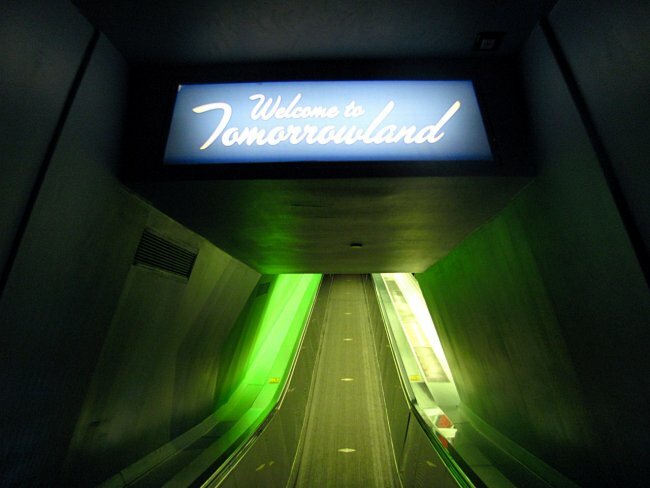 Above photo of the exit tunnel for Space Mountain by Loren Javier on Flickr. Photo released under a Creative Commons License. To learn more about Space Mountain in the Magic Kingdom, visit our other pages on the site.